Of all Bruckner’s numbered symphonies, the First needs the greatest help from the podium. The music’s drama regularly exceeds its scale, so the conductor must impose a clearly defined sense of structure and proportion. Marek Janowski is just the man for the task. His interpretations always work within strict, self-imposed limits of expression, and a level-headed approach to musical structure informs all his tempo choices. The results here can be occasionally frustrating, but for the most part, Janowski aids rather than hinders Bruckner’s expressive aims by setting his often wayward romanticism within a rigorous classical frame. I’m sure that I’m not alone in feeling that most of Janowski’s recent recordings for PentaTone have been a waste of talent and resources. In both his Wagner cycle from Berlin and his Bruckner cycle from Geneva, the orchestral standards are exceptionally high (something Janowski himself should take some credit for), the casting in the Wagner is almost flawless, and the SACD audio is as fine as any you’ll hear. Yet the personality of the conductor is imposed on every bar, and in such a way that, if you don’t like his readings, you’re not going to get much musical satisfaction. Janowski’s approach is fashionably strict, with generally fast tempos and, more frustratingly, an apparent allergy to almost any form of rubato. All those musical attributes are in evidence here, but for once their benefits outweigh their disadvantages. Janowski uses the Linz version of course—how long will it take for the music world to forgive Bruckner for returning to this score in later life?—and while that is the most familiar version, the music is transformed into something sleeker and more efficient than we usually hear. Brisk, rigorous tempos in the first movement highlight the affinities to Schubert and even to Mozart. The various woodwind solos and string interludes in the inner movements can cause the work to lose its way in more relaxed interpretations, but Janowski is able to keep the focus throughout. And the tempos selected for the finale, many but not all of which are extremely fast, ensure an ideal balance between the monumental scale of the tuttis in the often-ignored requirements for direction and momentum. The high standard of the orchestral playing ensures that less expression is lost than might otherwise be the case at this speed. The outer movement tuttis, rigorously paced as they are, all benefit from excellent orchestral tone, with the weighty sound of the horn section a particular asset. Similarly, the many phrases that Janowski stubbornly refuses to shape with rubato, particularly in the first movement transitions, retain their lyricism through the intensely musical playing of the strings. 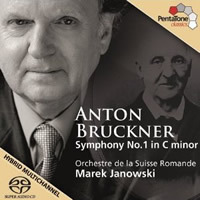 Like everything that Janowski has recorded recently, this interpretation of Bruckner’s First is certainly distinctive. For once, that is not a wholly bad thing. If, like me, you’ve struggled to find much musical pleasure from his Bruckner or Wagner recordings, this might be the disc to help you to at least start changing your mind. It won’t be going anywhere near the top of my favorites list, and comparison with the greatest recordings results only in a list of idiosyncrasies and missed opportunities on Janowski’s part. But if you listen to this recording on its own terms, it makes a lot of musical sense. Janowski hasn’t quite squared the circle in terms of balancing this work’s modest scale against its huge expressive aims, but by toning down the latter he has come closer than most.